Famous Accountants is pleased to announce an opening reception for Tunneling, a group show curated by Will Pappenheimer on Saturday, August 7th from 7-10pm. Famous Accountants presents Tunneling, curated by Will Pappenheimer: a spiraling group show featuring works by 11 artists and collaborators exploring the idea and aesthetics of “tunneling” in its various interpretations as a hallucinatory, near death, out of body, religious, underground, confining, degenerating, myopic, transitional, liberating experience or cultural moment. In psychotropic drug lore these conditions are known as the competing sensations of good or bad trips, where states of mind are euphoric or frightening, idealized or going awry. Some of the classic visual symptoms of tunneling are circular radiating, repetitive or tube-like formations. Sublime sensations and visions or horrific apparitions are spawned as artifacts in everyday scenes and circumstances. The occurrence of these experiences in religious tradition and practice are associated with apparitions of deities, liberation or proximity to death. Social contexts also take on the conflicting trajectories of opening up and shutting down, with the promise of progress continuously in peril of being undercut by intractable forces of power. Visible in this transit state are both sides of this pictorial turn. 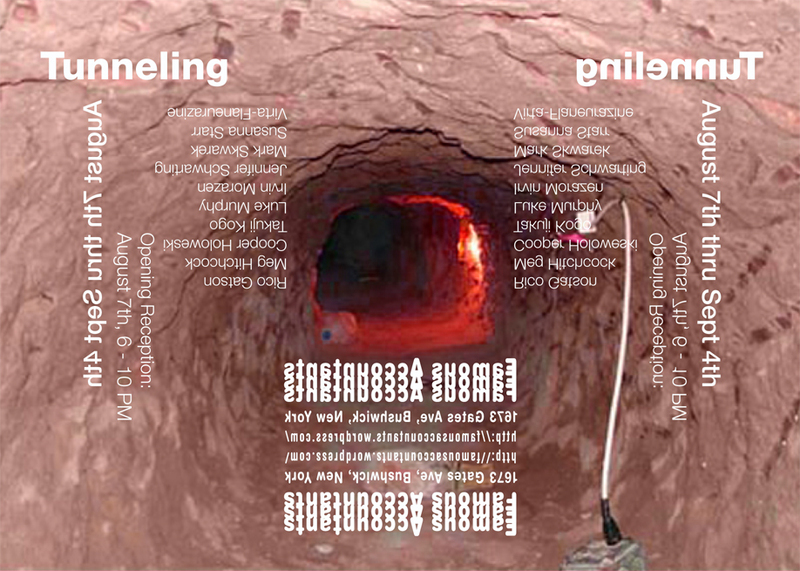 Tunneling includes artists working in a wide range of media that unfold different aspects of this theme. The show will include collage, video, sculpture, performance, new media, drawing and augmented reality. Additional performance dates in August TBA. what are your hours over there at Famous Accountants? Sundays from 1 – 6 PM (or by appointment).